Do you really think you are getting a good deal when given that free mobile phone for switching service providers, if a multinational retailer undercuts its competitors or by the fact that food is relatively cheaper today in many countries than ever before? Think again! As Michael Carolan clearly shows in this compelling book, cheapness is an illusion. The real cost of low prices is alarmingly high. It is shown for example that citizens are frequently subsidising low prices through welfare support to poorly-paid workers in their own country, or relying on the exploitation of workers in poor countries for cheap goods. Environmental pollution may not be costed into goods and services, but is paid for indirectly by people living away from its source or by future generations. Even with private cars, when the total costs of this form of mobility are tallied it proves to be an astronomically expensive model of transportation. All of these costs need to be accounted for. The author captures these issues by the concept of "cheaponomics". The key point is that costs and risks are socialised: we all pay for cheapness, but not at the point of purchase. Drawing on a wide range of examples and issues from over-consumption and waste to over-work, unemployment, inequality, and the depersonalising of communities, it is convincingly shown that cheapness can no longer be seen as such a bargain. Instead we need to refocus for a better sense of well-being, social justice and a balanced approach to prosperity. "While our consumer society has long been celebrated as an unrivaled mode of social organization, its gradual waning has now begun to focus attention on the fact that prevalent lifestyles are built on a mountain of ecological, financial, and societal debt. Cheaponomics expertly accounts for the costs that we have incurred and highlights alternative systems of exchange that promise to be immensely more satisfying in a world of increasingly constrained resources." – Maurie J. Cohen, Associate Professor of Sustainability Studies at the New Jersey Institute of Technology, USA and co-founder of the Sustainable Consumption Research and Action Initiative. "Michael Carolan has unearthed a fatal flaw in the economic status quo. That's quite a feat on its own. But more amazing is the way Carolan has sidestepped doom and gloom in Cheaponomics by providing logical examples, touches of humor, and plenty of solutions for societies that desperately need them." – Rob Dietz, former executive director of CASSE (the Center for the Advancement of the Steady State Economy) and co-author of Enough Is Enough: Building a Sustainable Economy in a World of Finite Resources. "Cheaponomics is a revelation! It uncovers the devastating truth behind the modern economy of 'bargains'. It turns out to be like a game of global Whack-a-Mole – when prices are pushed down in one place, the real costs pop up somewhere else, often in our own backyards. Michael Carolan finishes by describing a new game that would make 99% of us better off." – Clive Hamilton, Professor of Public Ethics at Charles Sturt University, Canberra, Australia and author of Growth Fetish, Affluenza and Requiem for a Species. "Michael Carolan presents a successful challenge to the conventional way we measure well-being. In sprightly prose and well-chosen data, Carolan shows that the costs of a race to the bottom in labor, environmental and social standards produces low retail prices that are opiates: addictive, destructive and unsustainable. More than a great teaching tool, Cheaponomics suggests an alternative – economic life whose goal, if we willed it, could be human fulfilment." – Robert J.S. Ross, Research Professor of Sociology and The Mosakowski Institute for Public Enterprise at Clark University, USA and author of Slaves to Fashion: Poverty and Abuse in the New Sweatshops. "Michael Carolan writes a great story, with numerous examples, on how we are addicted to cheap stuff with their massive societal costs like environmental pollution and negative consequences to our wellbeing. He concludes with practical recommendations for improvement. 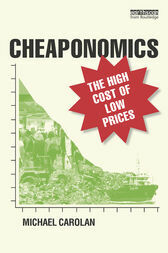 Cheaponomics is a must-read for all of us." – Philip Vergragt, Professor Emeritus of Technology Assessment, Delft University of Technology, The Netherlands, and a Fellow at Tellus Institute, USA. Michael Carolan is Professor and Chair of Sociology at Colorado State University, USA. He is the author of several books, including "The Real Cost of Cheap Food", "The Sociology of Food and Agriculture", "Reclaiming Food Security" and "Society and the Environment: Pragmatic Solutions to Ecological Issues".